There is something in the aspect of a camel that instantly puts all European ideas to flight: their patient mild endurance of fatigue and privation; the docility which they show in the most trivial matters, even if girted in the smallest degree too tight for their load, their hollow gurgling moan instantly makes the Arab guides aware of the cause of their distress; they kneel down to be laden, and rise with immense burthens on their backs; their gait is unlike that of any other animal: they have neither the sprightliness of the horse, nor the obstinacy of the mule, but seem to express, by their slow and lengthened step that they are aware of the tediousness of their journeys, which are only to be surmounted by constant and arduous perseverance; nature has happily endowed them with extraordinary powers of retaining their food for a length of time, in fact, it is impossible to picture any animal so completely formed to sustain the exhaustion and fatigue that they must undergo, from the scantiness of subsistence and water in these trackless sands. Across this desert no one will journey save on a camel, by reason of thirst. 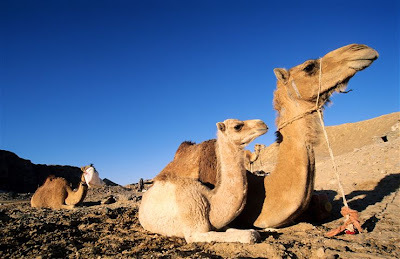 The best and most comfortable camel litters used on them are the shaqadif, and the best of these are those made in the Yemen for, like the travelling ashakin [seats] they are covered with leather and are roomy. Two of them are bound together by stout ropes and put across the camel. They have supports at each corner and on these rests a canopy. The traveller and his companion in counterpoise will thus be veiled from the blaze of the midday heat and may sit reclining at ease beneath its covering. With his companion he may partake of what he needs of food and the like, or read, when he wishes, the Koran or a book; and whoso deems it lawful to play chess may, if he wish, play his companion, for diversion and to' relieve the spirit. To be short it eases the hardship of travel. Most travellers ride their camels on top of their baggage and so painfully endure the rigours of the burning heat. Mrs. Elwood, en route through Egypt to India crossed the desert from the Nile to the Red Sea. The body of it is about six feet long, and three broad, composed of a curiously heavy-painted open wood-work, something like the Mameluke windows; and in this I lay as in a palanquin, which it little resembled. This was placed upon shafts, and carried by camels, one going in front, the other behind, as in a sedan- chair; the latter having its head tied down, in order that it might see where it stepped; and when they were in harness, it was raised nearly six feet from the ground. Strange-looking creatures are camels to an English eye, and a fearful noise they do make to an English ear; they stretch out their long necks one way, and they poke them out another, and there is no knowing where one is safe from them; and I was to mount a litter conveyed by these singular productions of Nature, probably the first and only Englishwoman that ever ventured in a native Egyptian Takhtrouan! My heart failed me terribly at this instant, I cannot but confess, and I was nervously alarmed at the sight of my unwieldy vehicle. However, “Come it slow or come it fast, It is but death that comes at last.” thought I, as I sallied forth to ascend my Takhtrouan. There were no steps, and we had neglected to take the precaution of bringing a ladder. What was to be done? Whilst I was hesitating, an Arab crouched down at my feet, and offered his back for my footstool. Was it not the Emperor Valerian by whom the cruel Sapor was wont to ascend his horse in a similar manner? I thought of him, as in this conquering style I entered my Takhtrouan. The motion was very unpleasant at first, and what with my fear and fatigue, I had a sensation of sickness, almost to fainting, come over me; however, I supported it as well as I could, and you cannot conceive how very strange my sensations when I found myself enclosed in a wooden cage, surrounded by wild Arabs, about to enter the Desert! Charles rode by my side upon a camel: at first he thought its movements were rough, but he ultimately preferred them to those of a horse. . .
At his own particular request, my Arab friend, who had hitherto so gallantly devoted himself to my service, was installed as my special attendant, the Knight of the Takhtrouan; and he undertook to guard me across the Desert.